Bonner Springs family makes custom knives – Welcome to Wyandotte Daily! One of the many things that makes Wyandotte County unique is the people and what they do. One company that is based in Bonner Springs, Kansas, is called Scott’s Custom Knives. Kevin Scott has been making knives for well over 15 years. Cindy Scott also makes knives for the company. They have received numerous awards for craftsmanship. They’re located in Bonner Springs, Kansas. 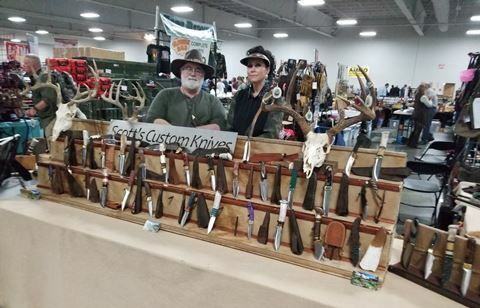 On March 23 and 24, they were at a gun and knife show held at the KCI Expo Center in Kansas City, Missouri. After talking to Scott, I learned a lot of what true craftsmanship really is. I was impressed. In my personal opinion, if you want custom knives this is the place to go. Scott’s Custom Knives has a website at www.scottscustomknives.com.